Why You Need To Keep Coming Back My Website! Well January has melted into March somehow and this is my first post of the year – sorry it is so late. I thought I would put down some of my thoughts and plans for the year here anyway. My most exciting news is the move into a bigger, lighter and airier studio than I was in before. It’s in the same building, but has a beautiful Northern light – the best for artists, with no direct sunlight but fabulous light for working in, with three large Victorian windows and white walls and ceiling. More windows into the gallery provide extra light and a beautiful wood floor makes for a gorgeous atmosphere. With this space I have plans! I want to create a mini arts centre within an Arts Centre. A place for healthy arts practices and workshops as well as a place for me to paint and illustrate the books I am commissioned for this year. The venue is Newhampton Arts Centre, Wolverhampton. If you look on the Workshops page of this site you will see more details – keep checking because new and exciting things are being added all the time. We have a good on site cafe and are only 10 minutes walk from Wolverhampton railway station – right in the middle of the UK. If there are any workshops you would like to see here please feel free to suggest them – let’s see if we can make them happen. I am very pleased to be collaborating with story teller Ana Lines this year and also developing ideas with Anne Marie Lagram. 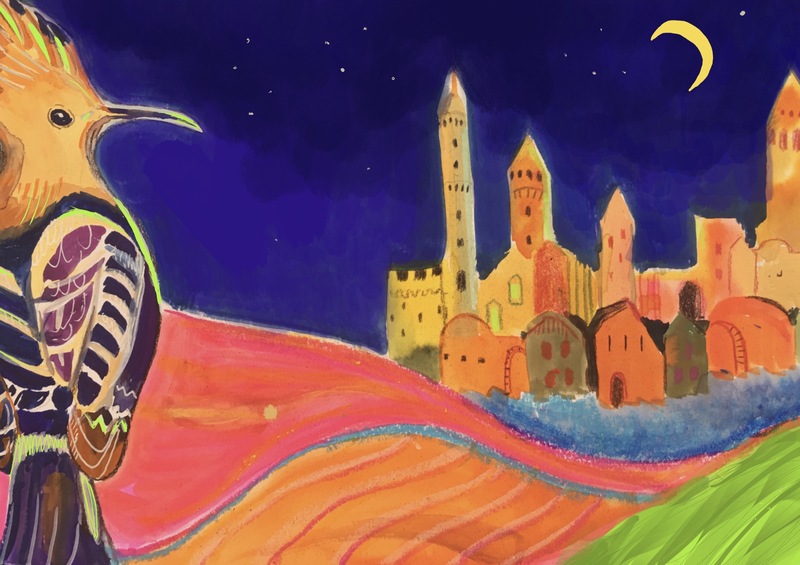 – a live art event inspired by Medgel- the witch- resulting in a collaboration of challenging visual imagery, story telling and audience participation! I am looking forward to sharing an exhibition with feltmaker and painter Kanj Nicholas and being part of an exhibition to commemorate 70 years since Partition in India and Pakistan in Wolverhampton in August organised by Komlaish Achall. I have a few trips to Saudi Arabia this year (it’s complicated!) 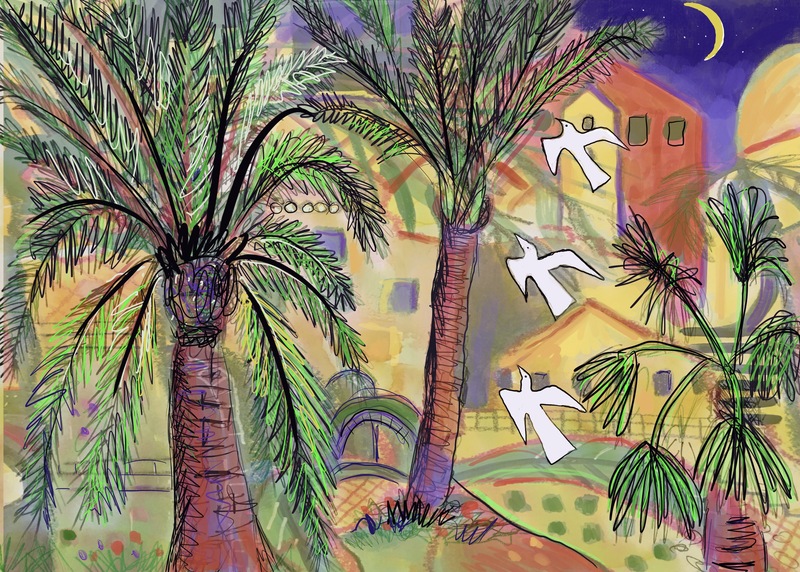 and I am looking forward to sketching and getting to know the country better – maybe some art to do with issues around that country will emerge. 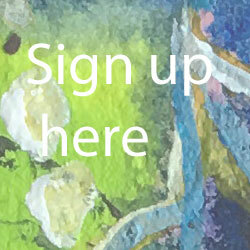 New things are emerging every week so keep checking back – especially on the Workshops page. If you don’t know me already this is a little about me and the year that has nearly finished. It’s been a whirlwind, very busy but very happy-making!! Clare Wassermann lives and works in Wolverhampton. Originally gaining an honours degree in Music with Education, then teaching and playing saxophone and clarinet in London and Nottingham, she re-qualified as a Registered Homeopath and returned to Wolverhampton in 2001. For fourteen years she happily combined teaching and homeopathy but then her artwork suddenly began to take off. She had started to paint larger paintings which were very vibrant and uplifting and buyers were inspired by their optimistic and health giving properties. “I love the idea of layer upon layer in paint, memories and experience. Some paintings have ten or even twenty layers built up and most are in response to my meditation and yoga practice. All are a pure celebration of my external and internal landscape. Juxtaposition of edges and colour combinations excite me. I use recurring symbols, meaningful to me and sometimes words in my layers, building up and letting go of images as I work. Sometimes I work in fabric and stitch for even more texture. I use my intuition, as far as possible, to take me on the journey towards a final balance point. This art practice becomes a metaphor for life”. In January 2016, after a successful exhibition, she took the plunge and rented a studio at Newhampton Arts Centre, Wolverhampton and since then things have moved apace. An American Author, Kathy Walsh, admired her work on Instagram and asked her if she would illustrate her next children’s book. “I looked at her previous books on Amazon and saw that she was writing with an aim to promote peace and mindfulness for children”, Clare commented, “so I decided to accept this opportunity and embrace a new genre for me”. The first two books, “Today An Elephant I Will Be” and “My Mindfulness ABC” are now available and I’m working on the third which will be out in the early part of next year. Kathy and she are planning some events in the U.S.A. next year. 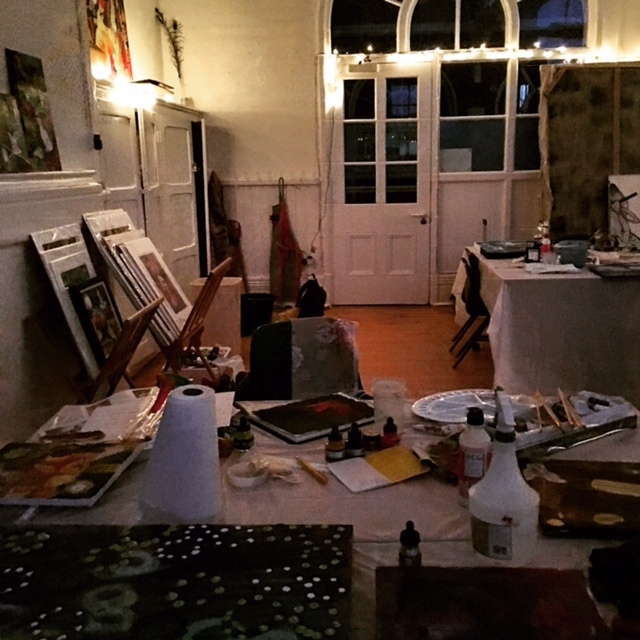 Another unexpected development has been teaching art workshops in the studio space. I work with small groups to open up creative ideas and build confidence in expression in paint and mixed media. 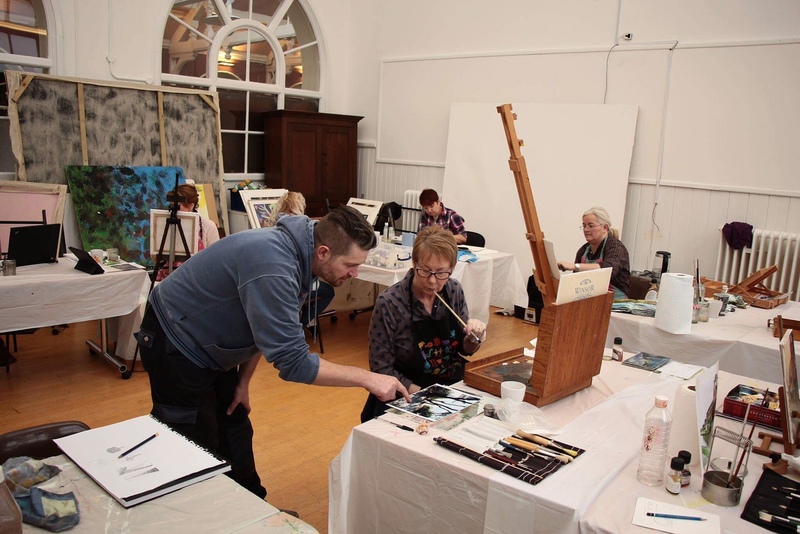 Artists who are experiencing block and adults who feel that they would like to paint creatively but lack confidence have all enjoyed these unusual and enjoyable days. A big THANK YOU to all those who have supported me and encouraged along the way. You know who you are, and I couldn’t have kept it up without you. I certainly am enjoying the longer days of Summer despite the enormous amount of rain that we have experienced here in the UK. But the upside of that is that everything is very lush and green around where I live. The garden is romping away and the weeds are growing, as usual twice as fast as everything else! It’s been a busy two months. My ‘creativity in paint workshops’ have taken off – all the sketchbook, 12″ canvas and 30″ canvas ones have filled up here in Wolverhampton, so I am shortly going to release some more dates on the Workshops page of this website. However I am taking to the road in October and doing some teaching in Cornwall (October 26th in Mylor Bridge, near Truro and October 27th at Threemilestone, also near Truro). 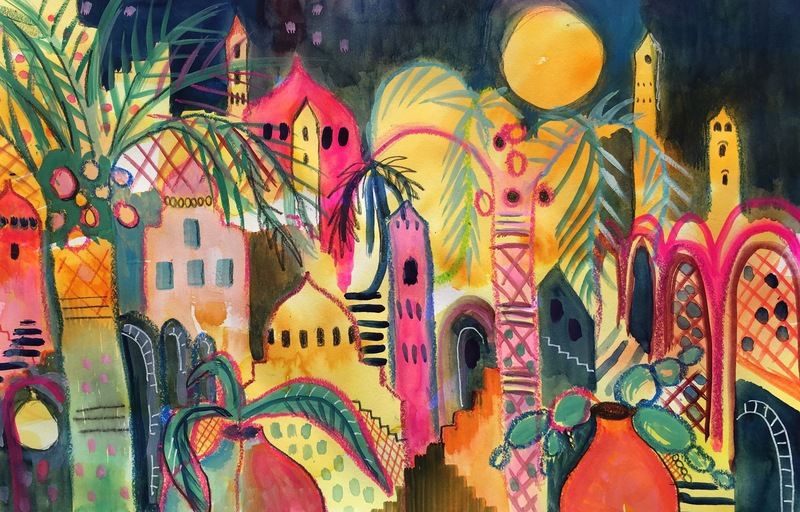 It’s all about expressing yourself in paint in sketchbooks and on paper – beginners and more experienced are very welcome. Crazy mad summer time – the season for art to come out of the closet it seems. I am lucky to be selected for exhibition currently in Derby Museum and Art Gallery, Wolverhampton Art Gallery, Asylum Gallery Wolverhampton and I’ve just been astounded to find myself in the Macynlleth Open at MOMA Wales from July 9th – September 1st with a small oil painting entitled ” At My Side My Cradled Infant Slumbers Peacefully” taken from a line from a poem by Samuel Taylor Coleridge. A great honour to be part of this. We had our own Pintar Rapido here in Wolverhampton last weekend which was a great community event. We called it Paint The Day – 70 members of the public got their paper and canvases stamped and rushed into the very changeable weather to paint scenes in the local area of Whitmore Reans in Inner City Wolverhampton. We returned our work by 5pm and overnight some elves hung the exhibition. It’s still up until next Saturday (July 9th) at Newhampton Arts Centre for the public to see at midday for two hours during the week and all day Saturday until the closing in the evening. All work is for sale and there is an auction on Saturday of remaining pieces. Proceeds go to keep this lovely Arts Centre open as the funding has all been removed by the Council due to continuing austerity measures. Do go and support everyone if you can – there’s some lovely children’s work. One of the beauties of keeping a sketchbook for painting in, I find, is not necessarily making notes and thumbnails for future work, but simply to feel an emotion into. This is what I try to teach on some of my workshops. The sketchbook is a freeing and liberating place sometimes, without the importance of a full sized painting. This week I attended a funeral for a colleague who’s life was cut short before she was even 40 years old. There are no words for this. It was useful for me to express the inexpressible. Both art and music do this for me. Yesterday I went to Saltaire, Yorkshire to visit the open houses there which have displays and sales of art in them from artists of the area. The houses in themselves are treat to visit, built as they were originally as dwellings for workers in the mill belonging to Titus Salt. There was some excellent art to be seen – it’s all open again today if you can manage the trip. Salt’s Mill itself is now an amazing building with galleries, shops and a huge amount of work by David Hockney. It was fabulous to stand so close to paintings such as this which are all in a shop which is filled with art books and materials – heaven! This is Salt’s Mill – huge! What’s more it has the most glorious kitchenware shop! See the workshops page above – I have opened a couple of new dates for Creative Sketchbooks workshops – click here for information as to what’s available – they are proving very popular. Wolverhampton Open Studios – my studio at Newhampton Arts Centre, Dunkley St., Wolverhampton WV1 4AN is open on June 25-26th 2016 from 10am – 3pm. Lots of other houses and studios are open that weekend. Bantock House and Park, Wolverhampton July 23rd – Sept 4th 2016 with a theme of “Birds”. Children’s activities and exhibition in the gallery. Street Art also by Steve Edwards.